As predicted a few weeks ago, a new report says Apple is now going to accept smartphones and PCs from other manufacturers and give owners a discount on new iPhones. Certain models of Android, Windows Phone and BlackBerry smart phones will be eligible toward immediate purchases of a new iPhone 5c, iPhone 6, or iPhone 6 Plus, reports 9to5Mac.com, as well as some PCs. The program’s expansion is rolling out in the U.S., France, United Kingdom, Germany, Canada and Italy as of today, with individual retail stores pages reflecting the change. Meanwhile, another version of the program that only allows for iPhone trade-ins is launching in China this week. So which phones can you trade in? TechCrunch says eligibility covers most flagship Android manufacturers, citing Apple, including but not limited to: Sony, Samsung, Nokia, LG, HTC and BlackBerry devices specifically. If your phone is in bad shape, however, don’t expect a trade-in credit, as it’s likely Apple will require the devices to have some value. 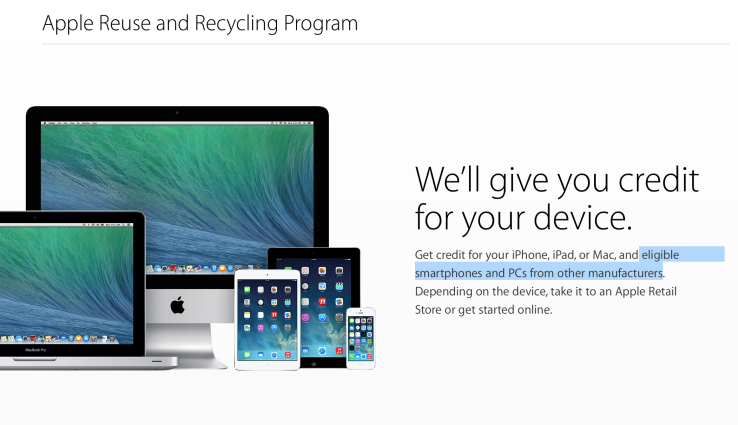 Those that can’t be traded in due to age or condition can be recycled with Apple’s help, however.